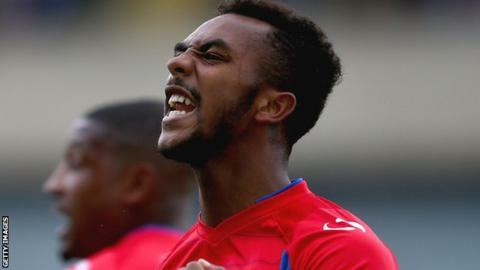 Dagenham & Redbridge climbed out of the League Two relegation zone with a point at mid-table Cambridge United. The U's took the lead when Ryan Donaldson's corner was flicked on by Michael Nelson for Cameron McGeehan to stroke home from close range. Dagenham's equaliser also came from a set-piece as Andre Boucaud's free-kick was met by the head of Ashley Hemmings. Cambridge, playing their first game since Friday's FA Cup draw with Manchester United, move up to 12th. Richard Money's side are now eight points off the play-off places, with at least a game in hand on teams above them. Match ends, Cambridge United 1, Dagenham and Redbridge 1. Second Half ends, Cambridge United 1, Dagenham and Redbridge 1. Corner, Cambridge United. Conceded by Scott Doe. Attempt blocked. Tom Elliott (Cambridge United) right footed shot from the centre of the box is blocked. Attempt saved. Ashley Hemmings (Dagenham and Redbridge) right footed shot from outside the box is saved in the centre of the goal. Attempt blocked. Joss Labadie (Dagenham and Redbridge) right footed shot from more than 40 yards on the right wing is blocked. Foul by Luke Chadwick (Cambridge United). Substitution, Dagenham and Redbridge. Joss Labadie replaces Andre Boucaud. Tom Champion (Cambridge United) is shown the yellow card. Damien Batt (Dagenham and Redbridge) wins a free kick in the defensive half. Attempt blocked. Ashley Hemmings (Dagenham and Redbridge) right footed shot from the left side of the box is blocked. Attempt blocked. Cameron McGeehan (Cambridge United) right footed shot from outside the box is blocked. Substitution, Dagenham and Redbridge. Alex Jakubiak replaces Jamie Cureton. Corner, Cambridge United. Conceded by Damien Batt. Substitution, Dagenham and Redbridge. Abu Ogogo replaces Luke Howell. Corner, Cambridge United. Conceded by Mark Cousins. Foul by Ryan Bird (Cambridge United). Ayo Obileye (Dagenham and Redbridge) wins a free kick in the attacking half. Attempt saved. Ryan Bird (Cambridge United) header from the centre of the box is saved in the centre of the goal. Tom Elliott (Cambridge United) wins a free kick on the right wing. Foul by Joe Widdowson (Dagenham and Redbridge). Attempt saved. Tom Elliott (Cambridge United) header from the centre of the box is saved in the centre of the goal. Billy Bingham (Dagenham and Redbridge) is shown the yellow card. Tom Elliott (Cambridge United) wins a free kick in the defensive half. Foul by Billy Bingham (Dagenham and Redbridge). Substitution, Cambridge United. Sullay Kaikai replaces Dominic Ball. Corner, Cambridge United. Conceded by Joe Widdowson. Ayo Obileye (Dagenham and Redbridge) is shown the yellow card. Ryan Bird (Cambridge United) wins a free kick in the defensive half. Foul by Ayo Obileye (Dagenham and Redbridge). Attempt missed. Rhys Murphy (Dagenham and Redbridge) right footed shot from outside the box is just a bit too high. Goal! Cambridge United 1, Dagenham and Redbridge 1. Ashley Hemmings (Dagenham and Redbridge) header from the centre of the box to the high centre of the goal. Assisted by Andre Boucaud with a cross following a set piece situation. Foul by Richard Tait (Cambridge United).